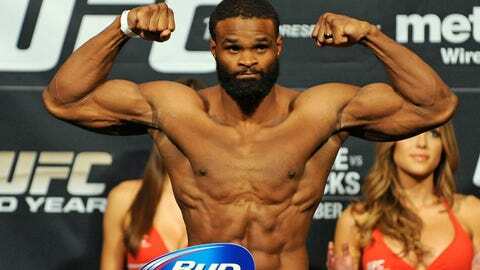 UFC fighter Tyron Woodley, a former wrestler at Mizzou, bombarded UFC president Dana White with text messages and wound up with a spot on UFC 171 in Dallas. Tyron Woodley got the biggest break of his UFC career last week. All it took was a couple of text messages. Well, a lot of text messages. Woodley, who graduated from McCluer High School in suburban St. Louis and wrestled at the University of Missouri, bombarded UFC president Dana White with text messages, up to 15 times a day, asking for fights. Then, last week, White announced that Woodley will face off with Carlos Condit on March 15 in a welterweight battle at UFC 171 in Dallas. Woodley is 12-2 in his MMA career, which included three years in Strikeforce. He is 2-1 in UFC with knockouts of Jay Hieron (UFC 156) and Josh Koscheck (UFC 167) and a controversial split-decision loss to Jake Shields (UFC 161). Woodley and Condit (29-7) will serve as the co-main event at UFC 171. The main event will feature Johny Hendricks vs. Robbie Lawler for the UFC welterweight championship vacated by Georges St-Pierre. The winner of the Woodley-Condit fight will likely be in position for a future fight with the new welterweight champion. If he wins in March, you can bet Woodley will be texting White for another opportunity. The Missouri hoops team will have plenty of time to think about what went wrong in its 65-64 loss to rival Illinois in the Braggin’ Rights Game on Saturday. There was plenty in the final 1:09, as detailed by colleague Stan McNeal here. The Tigers (10-1) won’t get back to action until Saturday, when they play at North Carolina State (9-2). After a 2-2 start, which included losses to Cincinnati and North Carolina Central, the Wolfpack have won seven straight games. North Carolina State is led by T.J. Warren, a 6-foot-8, 215-pound forward who averages 23.9 points and 7.3 rebounds per game. He scored a career-high 32 points in the Wolfpackâs 90-79 win against East Carolina on Saturday. Warren will be a good test for Mizzou’s young and developing starting frontcourt in freshman Johnathan Williams III and sophomore Ryan Rosburg. The Tigers are averaging 40.1 rebounds per game while limiting their opponents to 30.5 rebounds per contest. NC State is averaging 36.7 rebounds per game and holding opponents to 33.5. NC State has been outrebounded in three games, and the Wolfpack has lost two of those. After playing at NC State, the Tigers will host Long Beach State on Jan. 4 in their final non-conference contest. Missouri defensive end Michael Sam became just the second unanimous All-America selection in school history last week. Sam, the Associated Press SEC Defensive Player of the Year, earned first-team All-America honors from the Walter Camp Football Foundation, Sporting News, Associated Press, America Football Coaches Association (AFCA) and the Football Writers Association of America (FWAA). Sam led the SEC in sacks (10.5) and tackles for loss (18.0). He is the 33rd first-team All-American in Missouri football history and the seventh under coach Gary Pinkel. Sam follows in the footsteps of Dan LaRose, who played end for the Tigers from 1958-60 and was a unanimous All-American in 1960. LaRose, from Crystal City, Mo., finished eighth in the voting for the Heisman Trophy in 1960 — the winner was Navy running back Joe Bellino — and played six seasons in the NFL with the Lions, Steelers, 49ers and Broncos. The Mizzou football team announced five early enrollees last week: cornerbacks Kenya Dennis and Logan Cheadle, offensive lineman Mike Fairchild, linebacker Brandon Lee and quarterback Marvin Zanders. Scout.com rates Lee as a four-star prospect, Dennis, Cheadle and Fairchild as three-star prospects and Zanders as a two-star recruit. Rivals.com rates Dennis, Cheadle, Lee and Zanders as three-star prospects and Fairchild, whose father, Paul, played seven seasons in the NFL with the Patriots (1984-90), a two-star prospect. Scout.com ranks Mizzou’s recruiting class as the 10th best in the Southeastern Conference and 30th in the nation, while Rivals.com rates the class as 12th in the SEC and 32nd in the country. Pinkel and his coaching staff will try to use the momentum from this seasonâs 11-2, SEC East-winning team to build for the future. Once the coaches return from the Cotton Bowl, they will have about a month left before Signing Day to try to fill out this recruiting class with as much talent as possible.